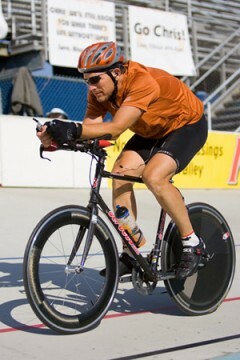 Chris Paradysz, 47, set a 24-hour velodrome record of 416.09 miles (669.63km) at the Valley Preferred Cycling Center in Breinigsville, Pennsylvania, raising $40,000+ for lupus research and the S.L.E. * Lupus Foundation. Chris who’s 19-year-old daughter Allie suffers from the disease broke the 28 year old record, set in 1980, of 391.29 miles (629.72km). Paradysz cycled as a teenager. But, until he began training for the 24-hour ride attempt last summer, he had rarely ridden a bike in 25 years. “This was an amazing accomplishment and a testament to a father’s love for his daughter,” said Margaret G. Dowd, executive director of the S.L.E. Lupus Foundation. “Lupus is a young women’s disease that often goes undiagnosed. It has been over 50 years since a new treatment was approved for lupus. Research money is urgently needed. continue reading "47-year-old Breaks 28 Year Old 24 Hours Bike Record"